AES New York Oct 15th 2017 – Pro | Mon | 3 is a complete audio monitor control solution that offers stand-alone monitor control functionality and speaker processing covering a wide range of functionality for music recording studios, location music recording, as well as post production environments of any size and type. You can experience the Pro | Mon | 3 license first hand at AES 2017 in New York at the DAD/NTP Technology booth (#331), which we share with our US sales partner plus24, from October 18th to 20th. With the new Version 3, DAD takes monitor control as an integrated part of its AX32 and DX32 units to a whole new level and via the new desktop Monitor Control Unit – MOM – with layered control functionality, you can easily operate and manage your speakers at the work space. 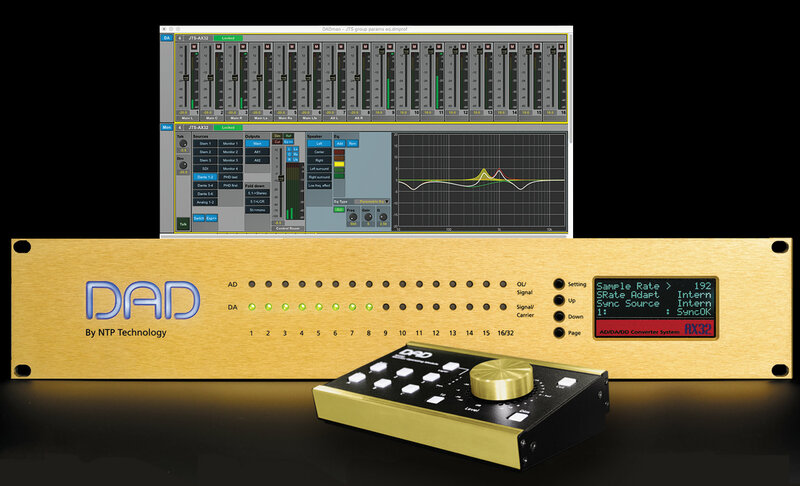 When adding the Pro | Mon | 3 license, a wide range of additional monitoring control features are added to the DADman software, enabling AX32/DX32 to operate as a powerful processor with full control of signal routing, control room speaker levels and monitor cues in any channel format including stereo, 5.1, 7.1.4, Dolby Atmos and other 3D and immersive audio formats. The control and configuration is managed by the new DADman 5.1 software, which also serves as a control center enabling devices compliant with Avid Eucon or MIDI to operate the monitor functions. Multiple monitors and cue outputs in various channel formats are yours to configure and control from one or more hardware MOM’s (Monitor Operating Module) with individual cue mix functionality and dedicated monitor mixing, adjustable parameters include level, pan, cut, mute and even downmix from, for example, a 7.1 multichannel format. You can save and recall all settings for quick and easy change between various monitor configurations.